Leopard’s Chase is one of the award winning “BIG CATS” courses in Ocean Isle, North Carolina. This beautiful Tim Cate creation has been the recipient of many awards and should continue this tradition as it is one of the very finest Myrtle Beach golf courses. Cate used the natural surroundings brilliantly on Leopard’s Chase incorporating elevation changes where the fairways wind through natural and man-made water hazards. The manicured fairways lead the way to beautiful L-93 Bentgrass greens. Leopard’s Chase offers several tee box options so that each golfer can select the ones that are suited to them and ensure that they will have a memorable Myrtle Beach golf experience. 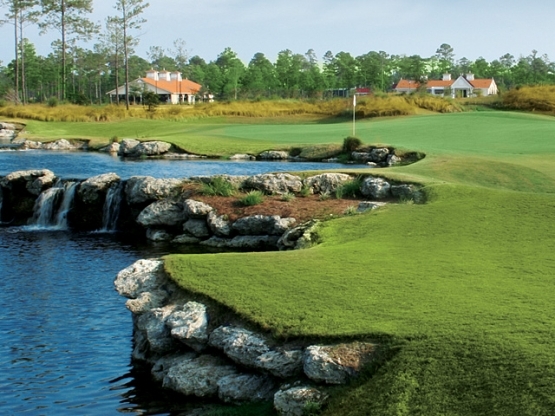 The 18th hole features a cascading waterfall and will offer the perfect Myrtle Beach golf photo opportunity. You certainly want to include this award winning Myrtle Beach golf course in your next North Myrtle Beach golf package. Leopard’s Chase is located just a short drive from North Myrtle Beach making it the perfect course to include with the outstanding North Myrtle Beach hotels, condos and beach houses. While staying in North Myrtle Beach be sure to visit the Ocean Drive Section and take in all of the iconic North Myrtle Beach “shag” clubs. The ‘Shag” is the State Dance of South Carolina and the “OD” Section and Main Street is its home. Great golf! Great accommodations! Great FUN! What are you waiting for? Book your Myrtle Beach golf package now!